Today I welcome fellow Love Historicals author Anna Markland with her first meeting excerpt, and this isn’t one that would normally set up the expectation of love. Something people may not be aware of about Anna is that since the summer of 2011, she has written and published 21 books. Astonishing! 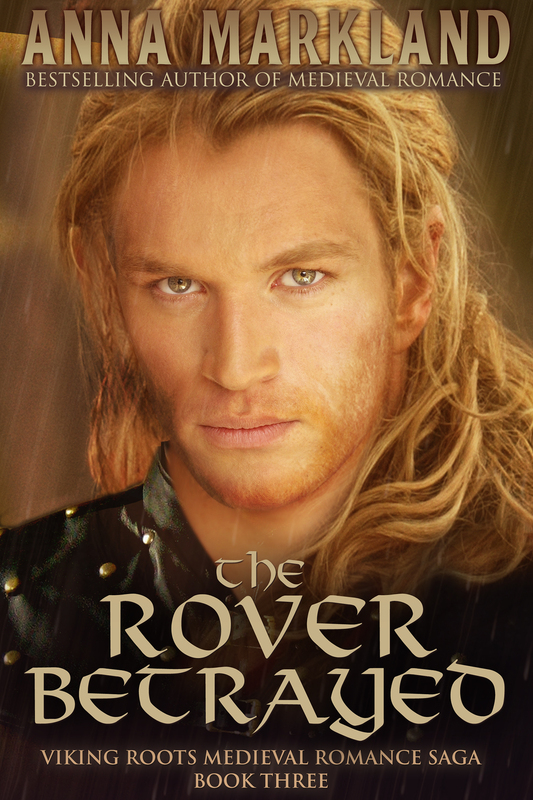 The Rover Betrayed is her Viking/Medieval romance released on Feb. 23. It’s the third book in the Viking Roots series. Magnus is a second generation Norman, a descendant of the first Vikings to settle in the Seine valley. Recently widowed, he is obliged to leave his grieving daughters to fight against Flemish incursions into Norman lands. In hotly disputed territory he comes across a wedding ceremony taking place outside a church. The bride, sister of the Flemish leader, swoons upon catching sight of the enemy troops. He jumps from his horse to save her from the mud. Magnus leapt from his horse and strode to the door of the abbey where an older woman—a servant he’d guess—struggled valiantly to keep her mistress from falling into the muck. He scooped up the mud-splattered maiden who’d swooned on first catching sight of them. His thoughts went back to the last time he’d held a woman in his arms, but he shook away the bitter memory. This one was still very much alive, as evidenced by the rapid rise and fall of her breasts. The appealing mounds of female flesh were big enough to fill his hand. A tingling tugged at the base of his spine, but then shame swamped him. He’d only recently buried his wife. Judging by the presence of the priest and a young man in black who’d fled at their arrival, he’d wager the wedding had been underway. But where were the well-wishers? He stared at the woman in his arms. Despite her disheveled appearance and pallor, heightened by the bright red of her nose, she was stunningly beautiful. Her tangled hair was the color of chestnuts. He willed her eyes to open, but she remained oblivious. A peculiar hope rose in his heart that he’d arrived in time to interrupt the wedding, but he quickly dismissed it. What did he care if Arnulf’s sister had wed a coward who’d run rather than defend his bride? The priest scowled, though his anger seemed to be directed more at the woman in Magnus’s arms than at him. Something strange was going on. Magnus didn’t look down, but surmised his Thor’s hammer must have worked its way free from under his gambeson. He decided to ignore the priest’s comment. He looked down at Arnulf’s sister. She felt right cradled against his chest, though she’d moaned softly a few times. He feared when she awoke and espied his father’s Viking helmet she’d think him a barbarian. Why it mattered he wasn’t sure. “Take her for a moment,” he said, intending to remove his headgear, but the priest backed away, his palms held out as if warding off evil spirits. What ailed the man? “I’ll take her,” his cousin, Bendik offered, coming to his side. An surge of jealousy addled Magnus’s wits and he clutched the stricken woman more tightly. Bendik chuckled. “I won’t harm her,” he said. Magnus laughed at his foolishness and handed her over. He removed his helmet, thrust it into the priest’s hands, then retrieved his prize. It was lunacy and Bendik’s frown indicated he agreed. The town and abbey had to be secured, but the only thought on his mind was the desire to comfort a beautiful woman. Judith was warm for the first time in days. A man with a deep, soothing voice was carrying her. It rumbled from his chest—a solid chest, though it felt good to rest her weary head against it. She wanted to murmur her gratitude to the brave hero who had rescued her from a fate worse than death, but her throat was too dry. He must be one of Arnulf’s men. She slowly opened one eye and looked up. She was in the arms of a fair-haired giant whose broad shoulders blotted out everything else around her. He was still speaking, but her head was stuffed with the wool of a newly shorn sheep and a drum pounded in her ears. She cleared her throat, but swallowing was difficult. “Don’t be afraid,” Beatris said. It wasn’t Theodoric carrying her. How unseemly to be in the arms of another man. The memory crashed in. Surely Arnulf hadn’t wed her to a freak of nature. “Husband,” she shrieked. “He has fled,” the deep voice said with a strange accent. He must be a foreigner. Riders led by a massive barbarian. Her heart raced. She looked up again at the stubbled chin of her hero. Her eyes fell on a silver pendant nestled in the folds of his gambeson. Dread seized her. It was a pagan symbol; the hammer of one of the Norse gods. Her savior was a Viking. It didn’t make sense. Vikings didn’t save women. They carried them off, raped then slaughtered them. She flailed her arms and legs, desperate to escape. She had to warn Beatris. “Vikings!” she screamed. You can find The Rover Betrayed at the following sites. Thanks, Anna, for visiting with me today!